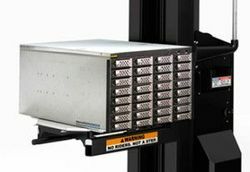 The ServerLIFT SL-500FX is an automatic and battery-powered lifter with a platform that can be extended at the front by up to 29.2 cm to allow IT equipment such as servers, network switches, UPSs and other equipment to be securely inserted deep into the rack and easily installed. The platform can even be extended by up to 50.8 cm using an extension supplied with purchase. The maximum capacity of the standard version is 226.8 kg and 158.76 kg of the SL-500FX with extension. The platform can start just a few centimetres above floor height and be raised up to 2.44 m. It can be loaded from both the right and left side of the platform. The support arm has a TouchSTOP sensor that immediately stops the lifting process if it comes into contact with the data centre ceiling, roof panels, low-hanging lines or other height constraints. 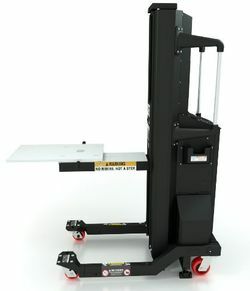 The compact dimensions of the ServerLIFT SL-500FX and the dual locking system for the wheels ensure excellent manoeuvrability even in narrow rack corridors or contained aisles. The QuickTILT Leveling system easily and quickly compensates for uneven floors and inclined positions of up to 5 degrees. 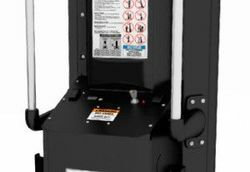 When the battery is fully charged, the server lifter can be reliably operated up to 8 hours.